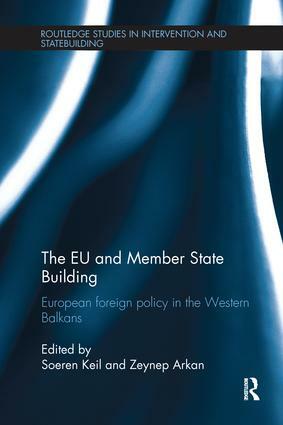 This book critically examines the process of statebuilding by the EU, focusing on its attempts to build Member States in the Western Balkan region. This book analyses the European Union's policies towards, and the impact they have, upon the states of the Western Balkans, and assesses how these affect the nature of EU foreign policy. To this end, it focuses on the tools and mechanisms that the EU employs in its enlargement policy and examines the new instruments of direct intervention (in Bosnia and Kosovo), political coercion (in the case of Croatia and Serbia in relation to the International Criminal Tribunal for the former Yugoslavia), and stricter conditionality in the Western Balkan countries. The book discusses the key aim of this special form of statebuilding, which is to establish functional liberal-democratic states in Albania, Bosnia and Herzegovina, Croatia, Kosovo, Macedonia, Montenegro, and Serbia in order for them to join the EU and to cope with the responsibilities and pressures of membership in the future. However, the authors argue that while the EU sees itself as an international actor that promotes and protects liberal-democratic values, norms and principles, its experiences in the Western Balkans demonstrate how the EU´s actions in the region have undermined the basic principles of democratic decision-making (such as the European support for impositions in Bosnia) and international law (Kosovo), and have consequently contributed to new tensions (see police reform in Bosnia, and the tensions between Kosovo and Serbia) and dependencies. This book will be of much interest to students of statebuilding, EU politics, global governance and IR/Security Studies in general. The limits of normative power? Time to move away from retributive justice?